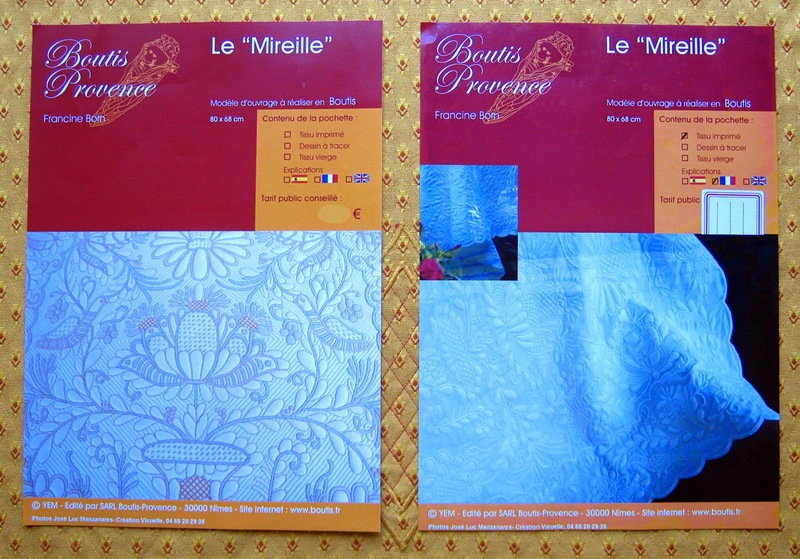 The central motif of "Le Mireille". 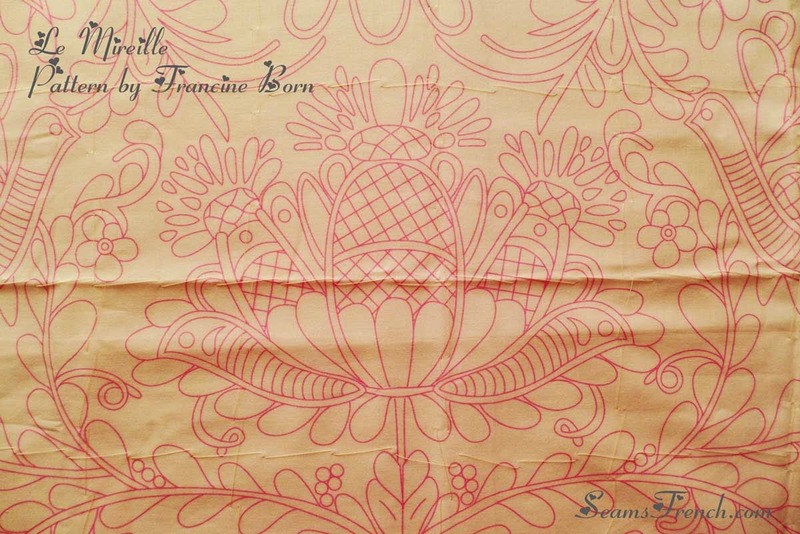 "Le Mireille" is one of Madame Born's traditional designs. In her own class sample (below), she has used several different stitches as well as different weights of thread to add interest and to highlight certain motifs of the design. 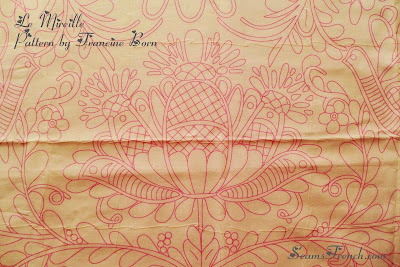 A small section of Francine Born's class sample showing several different types of stitches. In the pattern cover below on the left, she has used coloured cording in the channels instead of the traditional white. 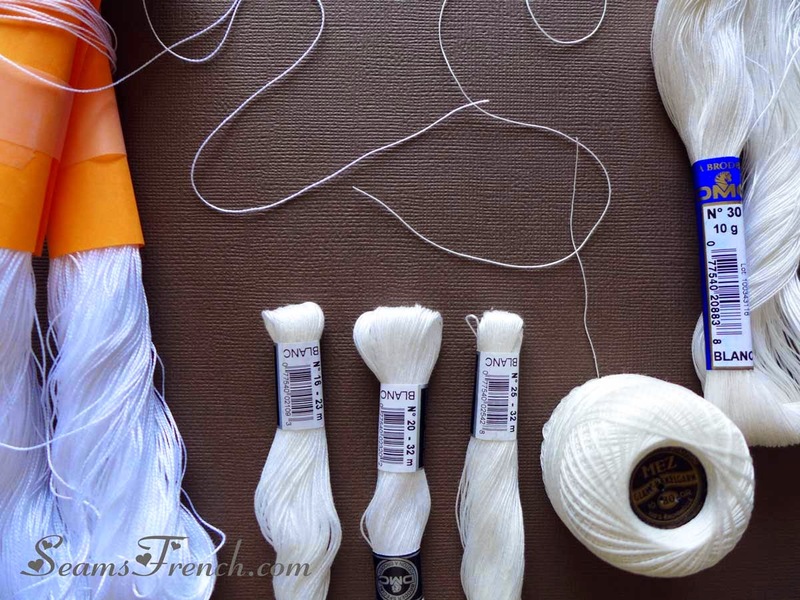 The same design on the right is corded with white yarn. 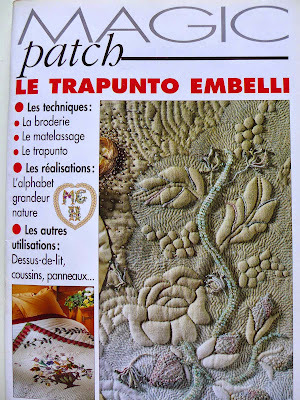 To see more of her patterns, check out her website at http://www.boutis.fr/. The pre-printed pattern (shown below) is 80 x 68 cm (approx. 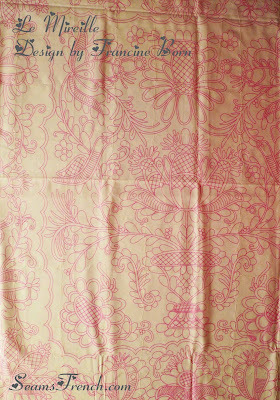 31 1/2" x 23 1/2") and, as is typical for boutis, the space is almost entirely covered with the design. If desired, the little bit of empty background space can be completely filled in with corded channels called "vermicelli", as you can see in the above pattern on the left. The central motif is the place to start the stitching journey. 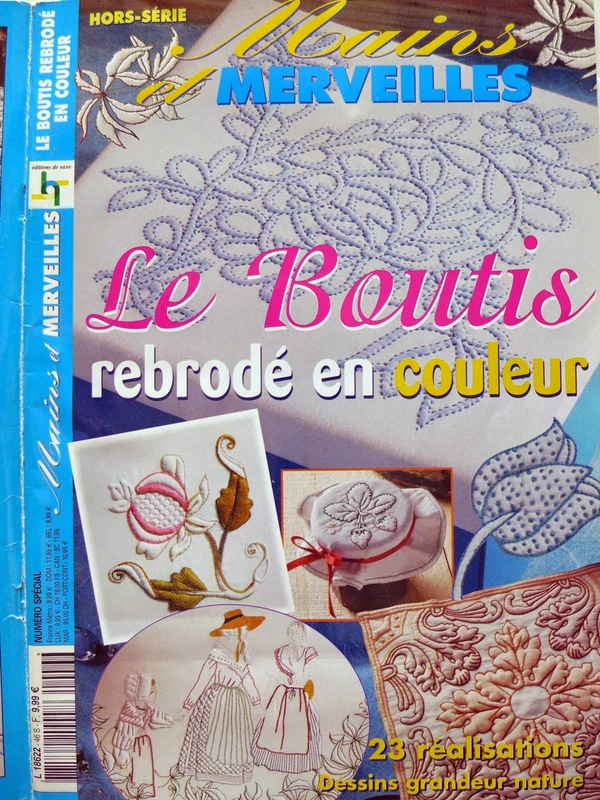 In my stash are some French stitching magazines that show further ways of applying creativity to boutis, or corded stuffed whitework. 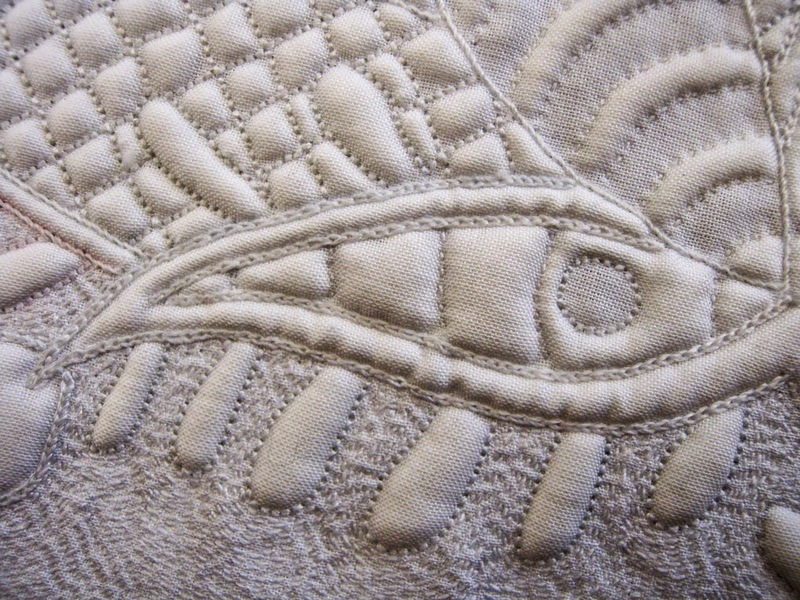 I have started stitching the piece with the center motif. 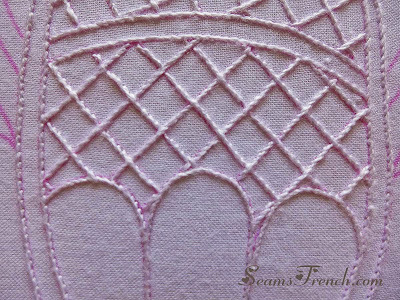 Using a heavier then normal embroidery thread with the outline stitch (point de tige) requires a little more time and careful attention. 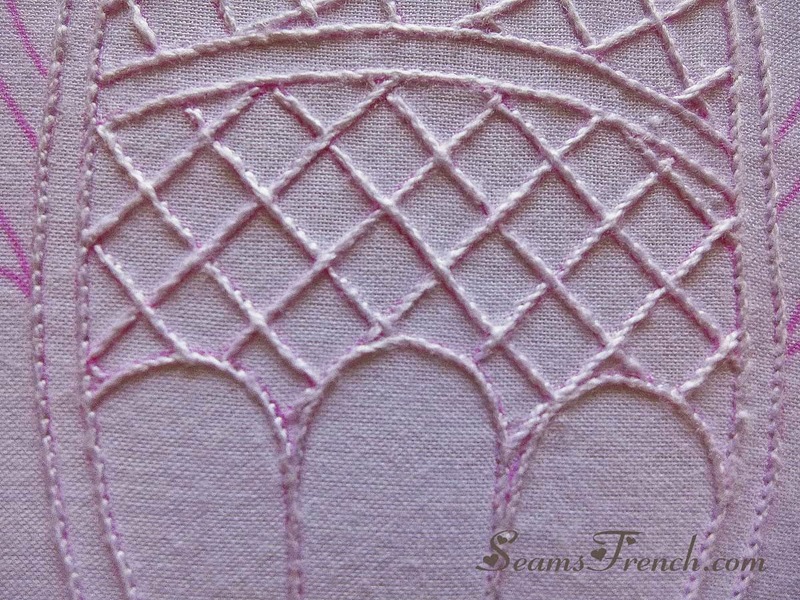 As I proceed with the piece, I will go into more detail on the stitches and threads as I use them. Purchased in France, these are some of the threads that I will be using in the piece. Since this is a fairly large piece at 80 x 68 cm, I expect it will take me a long time to complete. 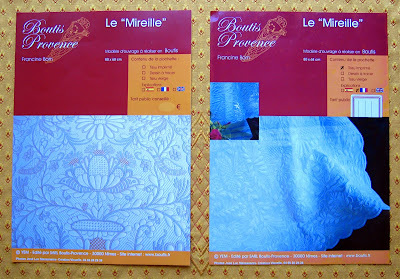 Aside from other quilting and stitching, I am also working on my own boutis designs, but I hope to take a little time each day to work at "le Mireille" and have fun playing with the stitches and threads. When you first directed us to Mme Born's website, this was by far my favourite project. So I am going to enjoy seeing you work it! What will happen to the pink printing? Will it wash away? Gosh, you are really tempting me now! The pink print disappears with heat, (as I learned when I tried to press part of it). Oops! I think that if you would try it, you would really enjoy working on boutis. Because it's relatively portable and easy to pick up any time, it becomes quite addictive. Think about it. I love the different color of yarns in the fillings. 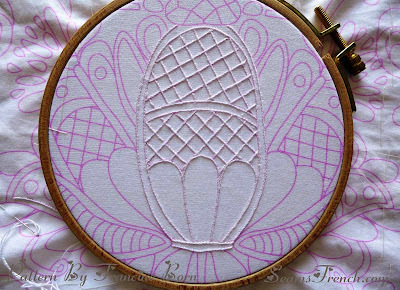 This will be an interesting piece, and I hope you share all the details of stitches, threads and fillers. Hi Cynthia. I hope to have fun with this piece, experimenting with threads, yarns and other embellishments. This project will likely take a number of years, but I will share my progress as I work my way through it. Lovely piece, I have that pattern also but I have a couple of large ones to complete before that ! Your stitching is beautiful. Thank you Heather. Coming from you, that is a great compliment. 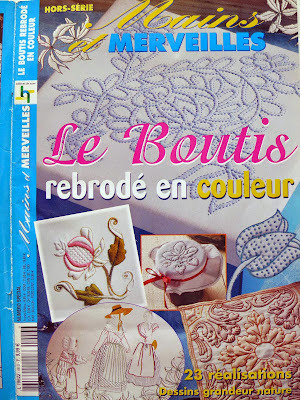 Mostly, I work on my own designs, but I have a number of designs that I have acquired in France, and I think that in order to understand boutis better, I need to work on traditional French designs. I would love to see what you are working on these days.